Grace Darling Hotel - 30th September 2011. The day before the Pies were due to meet Geelong in the Grand Final. Recap of the meeting held at the Grace Darling Hotel - Mercury and Weekly Courier 27th June 1889. 114 Smith St, Collingwood Victoria 3066 is the location of the Grace Darling Hotel and is considered as the birthplace of the Collingwood Football club. 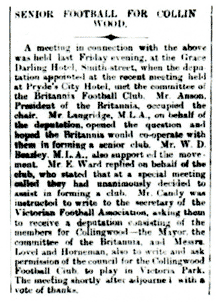 It is here that in the evening of the 21st June, 1889 that the deputation of the proposed Collingwood Football Club met with the Britannia committee in the basement of the Grace Darling Hotel seeking Britannia's support for the new club (Senior Football for Collinwood, 1889). The meeting consisted of Mr Anson, president of the Britannia Club, Mr Langridge & Mr W.D Beazley of the Members Legislative Assembly (M.L.A) and Mr E. Ward for Britannia. By the close of the meeting, Britannia had unanimously agreed to assist in the formation of the Collingwood Football Club. When it comes to finals the hotel has the black and white flags, and the black and white balloons flying. It becomes a popular watering hole for fans of the football club sitting in the midst of the blue stone walls that their club was born in, and all the while being in the heart of the suburb of Collingwood. Sitting or standing, one can hear the barrackers a shouting for their team. 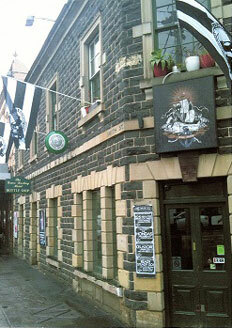 Keen to check out the Grace Darling Hotel ?